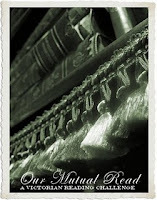 Our Mutual Read is hosted by Amanda at The Blog Jar. This title of this challenge is inspired by the novel, Our Mutual Friend, by Charles Dickens and it focuses on any literature written between 1837 – 1901. While I often think of this time period as Victorian literature, after Queen Victoria of England, I also tend to equate it with British Literature. However in this challenge literature from any country written during this time period or inspired by this time period (neo-Victorian) will be accepted. Level 1: 4 books, at least 2 written during 1837 – 1901. The other books may be Neo-Victorian or non-fiction. Level 2: 8 books, at least 4 written during 1837 – 1901. The other books may be Neo-Victorian or non-fiction. Level 3: 12 books, at least 6 written during 1837 – 1901. The other books may be Neo-Victorian or non-fiction. There are also 3 optional mini-challenges — one that focuses on movies of this time period and the other focuses on short stories. For now I am going to sign up for level 1 — and will not commit to either of the mini-challenges. But who knows….I may get carried away and do far more than this minimal level. A challenge that marries very well with Our Mutual Read is Book Chick City’s Typically British Reading Challenge. While the challenge above does not limit our reading material to that of the U.K. — that is my personal preference, so I am sure that I will be double dipping for both these challenges. But I simply couldn’t resist this adorable button with the bulldog looking so dapper. • “Put The Kettle On” – Read 2 Typically British novels. • “Gordon Bennett” – Read 4 Typically British novels. • “Bob’s Your Uncle” – Read 6 Typically British novels. • “Cream Crackered“ – Read 8 Typically British novels. I think I will shoot for the Gordon Bennett level of participation and strive to read 4 novels. Again, since I teach Brit Lit and absolutely love the Victorian time-period, I actually hope to reach the Cream Crackered level (and don’t you just love that title) …. but I do not want to over-commit too early in the game. The final challenge that I have decided to join is the 2010 Bibliophilic Books Challenge hosted by Lesley of A Life in Books. This challenge focuses on books about books and/or reading. I tend to go through a phase of at least once a year where I want to learn how to gain more from my reading experience. Oftentimes this will involve reading books on literary criticism and/or books written by authors about their writing process. This challenge seems to fit perfectly with that inevitable mood. In addition, books that count toward this challenge can be either non-fiction, such as the kind listed above, or fiction, such as the Eyre Affair or The Shadow of the Wind (one already on the TBR pile). Again, I will not set my sights too high and sign up for the Bookworm level, with the hopes of achieving Litlover status. This challenge also runs from January 1 – December 31 — which is somewhat of a shame as I have read two “bibliophilic” books in the last two weeks. Oh well, I know how much I enjoyed these two reads and fully anticipate discovering similar books in the months ahead. I am still giving considerable thought to joining the Chunkster Challenge. If my dream of attending Oxford comes true, then I will definitely take part in that challenge as two of my reading materials fall into the chunkster cateogry. I am really very excited about the upcoming literary year. Aside from these 3 challenges listed above, I also plan to take part in the 2010 Support Your Local Library Challenge, the Read the Book, See the Movie challenge, the Flashback Challenge, and the Rory Gilmore Books Project. How about you? Have you succumbed to the challenge temptation? If so, which ones have you joined? If not — how do maintain such self-control? Happy New Year, Molly. I'm so glad you joined the British challenge. There are so many good ones out there but I feel like a failure if I didn't complete them so I am sticking with the 3 I signed up for. Maybe next year, I'll get as adventurous as you are. Have fun with your challenges, Molly! I'm looking forward to Our Mutual Read. I would like to do these others, but I am afraid of the number of challenges I have signed up for. Don't you just love challenges. They really make the reading year interesting. I am doing the first two as well. Good luck. Ooo! These sound good too! Good luck! I'm doing Our Mutual Friend, too. I actually think I can do entirely from books that cross over from other challenges which has become a big guideline for me in choosing challenges. All of these seem like such a good fit for you … have fun with them!